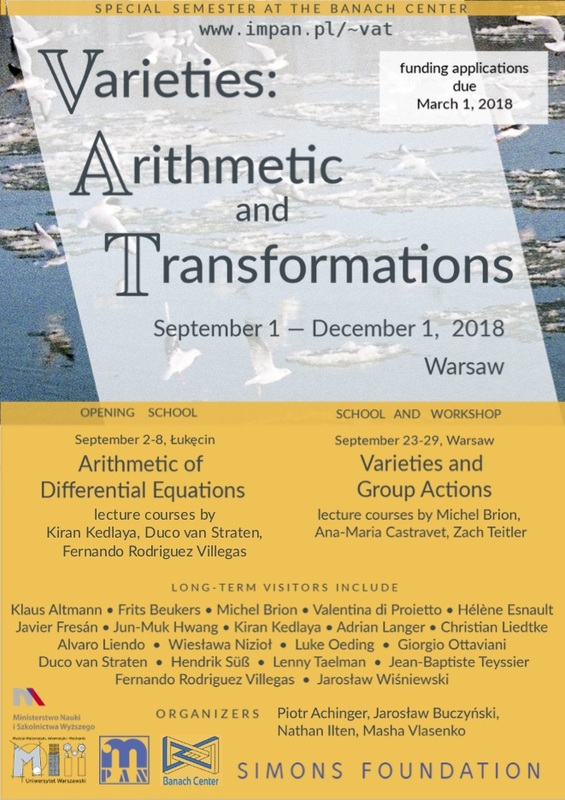 We are pleased to announce a semester in a range of topics in algebraic geometry. The program is a part of series of research oriented Simons Semesters at the Banach Center in Warsaw (Poland). The Targeted Grant to Institutes of Simons Foundation is administered at IMPAN (Institute of Mathematics of the Polish Academy of Sciences). Supplementary funding is provided by IMPAN and the Polish Ministry of Science and Higher Education (MNiSW). One of the previous semesters also concerned algebraic geometry: miniPAGES (April 18-June 18, 2016). The list of other semesters is available here. Parametrizing varieties: Hilbert scheme of points, rational curves on manifolds, secant varieties, tensor ranks, Waring ranks and related notions with their applications to complexity theory, engineering and quantum physics. In addition to the events listed below, weekly activities will be held at the Banach Center in Warsaw and at the University of Warsaw. These will include research seminars, lectures, and lecture series given by the leaders of our program. Participation of postdocs and PhD students will be especially encouraged. The following is the default schedule for October and November (weeks 5 through 13). A more detailed schedule will be available later. Joint meeting of the Italian Mathematical Union, the Italian Society of Industrial and Applied Mathematics and the Polish Mathematical Society in Wrocław (Sep 17-20). Formally, this is not a part of our semester. The following are the research and study groups running during the VAT semester. Please contact the organizers listed below if you wish to join. For 1), and 2), one just adds the report number as a part of Metadata. For 3), in personal arxiv account, click "journal-ref" and add the code in the field "Report number".